Background: Hospitals, the main providers of healthcare services, are costly centers which account for about 80% of the health sector budget and have a huge share of resources. Objective: This study aimed to analyze the economic performance of selected military hospitals in Tehran using hospital indicators and inpatient bed-day costs. Methods: This descriptive, cross-sectional, retrospective study conducted in hospitals affiliated with a military medical university. Data was collected with forms completed by referring to the hospitals’ finance and accounting, medical records, staffing, and logistics departments. The extracted data converted to hospital indicators using the appropriate formulas and analyzed using Excel and SPSS software with the T-test. Results: The average bed occupancy rate (BOR) was 71%, the average length of stay (ALOS) was 2.5 days, the average bed turnover (BT) was 31 times, and the average bed turnover interval (BTI) was one day. The comparison of means of all the above-mentioned indicators other than BOR with the national standards was statistically significant (P < 0.05). Inpatient bed-day costs with and without capital costs were calculated to be 3 312 353 IRR and 12 253 775 IRR, respectively. Conclusion: Higher BOR and BT and lower ALOS and BTI indicators were appropriate compared with the national standards, but the cost performance was not appropriate. An unreasonable increase in inpatient bed-day cost revealed that there were unused beds and that hospitals had no monitoring systems for revenues and expenditures. Therefore, serious attention must be given to the scientific criteria and principles of health economics to improve resource productivity. Nasiriad N, Rashidian A, Joodaki H, Akbari Haghighi F, Arab M. Assessing issues and problems in relatioship between basic insurance organizations and university hospitals: a qualitative research. J Hosp. 2010;9(1-2):5-18. [Persian]. Najibi M, Dehghan H, Jafari A, Hoseinpour T, Rezaee R. A study of the problems between basic insurance organizations and teaching hospitals of Shiraz University of Medical Sciences as viewed by the staff of income hospitals and representative of the insurer’s organization in 2013. J Health Man Info. 2015;2(3):82-88. Hadian M, Mohammadzadeh A, Imani A, Golestani M. Analysis and unit cost estimation of services using “Step- Down Method” in Fatemieh Hospital of Semnan University of Medical Sciences-2006; Iran. Journal of Health Administration. 2009;12(37):39-48. [Persian]. Barnum H, Kutzin J. Public hospitals in developing countries: resource use, cost, financing. Baltimore: Johns Hopkins University Press; 1993. Jacobs P, Rapoport J. The economics of health and medical care. Massachusetts: Jones & Bartlett Learning; 2004. Lieu T, Messonnier ML, Meltzer MI. Guidance for health economics studies presented to the Advisory Committee on Immunization Practices (ACIP). Atlanta: Centers for Disease Control and Prevention; 2008. Ebadi F, Ansari H, Rezapoor A. Study of daily bed occupancy costs and performance indexes in selected hospital at of Iran University of Medical Sciences in 2002. Journal of Health Administration. 2005;7(18):37-44. [Persian]. Amerioun A, Hosseini Shokouh SM, Karimi Zarchi AA, Mahmoudi N. Hospital manager’s leadership style from staffs viewpoint and its relationship with hospital indicators. J Mil Med. 2011;13(3):125-132. Shepard DH, Hodgkin D, Anthony Y. Analysis of hospital costs: a manual for managers. Geneva: World Health Organization; 2000. Meltzer MI. Introduction to health economics for physicians. Lancet. 2001;358(9286):993-998. doi:10.1016/S0140-6736(01)06107-4. Meltzer MI. Health economics and prioritising health care. Lancet. 2008;372(9639):612-613. doi:10.1016/S0140-6736(08)61257-X. Weinstein MC, Skinner JA. Comparative effectiveness and health care spending--implications for reform. N Engl J Med. 2010;362(5):460-465. doi:10.1056/NEJMsb0911104. Jonaidi Jafari N, Sadeghi M, Izadi M, Ranjbar R. Comparison of performance indicators in one of hospitals of Tehran with national standards. J Mil Med. 2011;12(4):223-228. 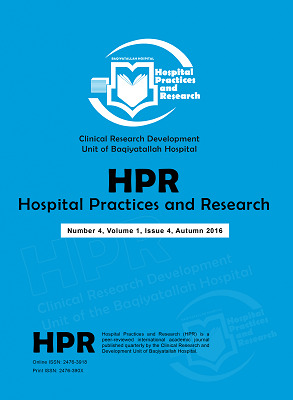 Sadeghifar J, Ashrafrezaee N, Hamouzadeh P, Taghavi Shahri M, Shams L. Relationship between performance indicators and hospital evaluation score at hospitals affiliated to Urmia University of Medical Sciences. J Urmia Nurs Midwifery Fac. 2011;9(4):270-276. Hosseini Shokouh S, Arab M, Rahimi A, Rashidian A, Sadr Momtaz N. Preparedness of the Iran University of Medical Sciences hospitals against earthquak. Journal of School of Public Health and Institute of Public Health Research. 2009;6(3):61-77. [Persian]. Hosseini Shokouh SM, Anjomshoa M, Mousavi SM, et al. Prerequisites of preparedness against earthquake in hospital system: a survey from Iran. Glob J Health Sci. 2014;6(2):237- 245. doi:10.5539/gjhs.v6n2p237. Jacobs P, Rapoport J, Edbrooke D. Economies of scale in British intensive care units and combined intensive care/high dependency units. Intensive Care Med. 2004;30(4):660-664. doi:10.1007/s00134-003-2123-2. Sakharkar BM. Principles of hospital administration and planning. New Delhi: Jaypee Brothers Medical Pub; 2008. Garcia S, Ruza F, Alvarado F, et al. Analysis of costs in a pediatric ICU. Intensive Care Med. 1997;23(2):218-225. doi:10.1007/s001340050320. McDermott C, Stock GN. Hospital operations and length of stay performance. Int J Oper Prod Manag. 2007;27(9):1020- 1042. doi:10.1108/01443570710775847. Thomas JW, Guire KE, Horvat GG. Is patient length of stay related to quality of care? Hosp Health Serv Adm. 1997;42(4):489-507. Ashby J, Guterman S, Greene T. An analysis of hospital productivity and product change. Health Aff (Millwood). 2000;19(5):197-205. doi:10.1377/hlthaff.19.5.197. Glick HA, Orzol SM, Tooley JF, Polsky D, Mauskopf JO. Design and analysis of unit cost estimation studies: How many hospital diagnoses? How many countries? Health Econ. 2003;12(7):517- 527. doi:10.1002/hec.750. Burns LR, Chilingerian JA, Wholey DR. The effect of physician practice organization on efficient utilization of hospital resources. Health Serv Res. 1994;29(5):583-603. Polverejan E, Gardiner JC, Bradley CJ, Holmes-Rovner M, Rovner D. Estimating mean hospital cost as a function of length of stay and patient characteristics. Health Econ. 2003;12(11):935-947. doi:10.1002/hec.774. Langland-Orban B, Gapenski LC, Vogel WB. Differences in characteristics of hospitals with sustained high and sustained low profitability. Hosp Health Serv Adm. 1996;41(3):385-399. Sear AM. Operating characteristics and comparative performance of investor-owned multihospital systems. Hosp Health Serv Adm. 1992;37(3):403-415. Butler TW, Leong GK. The impact of operations competitive priorities on hospital performance. Health Care Manag Sci. 2000;3(3):227-235. doi:10.1023/A:1019057811167. Lagoe RJ, Westert GP, Kendrick K, Morreale G, Mnich S. Managing hospital length of stay reduction: a multihospital approach. Health Care Manage Rev. 2005;30(2):82-92. doi:10.1097/00004010-200504000-00002. Caron A, Jones P, Neuhauser D, Aron DC. Measuring performance improvement: total organizational commitment or clinical specialization. Qual Manag Health Care. 2004;13(4):210-215. Anderson JG, Harshbarger W, Weng HC, Jay SJ, Anderson MM. Modeling the costs and outcomes of cardiovascular surgery. Health Care Manag Sci. 2002;5(2):103-111. doi:10.1023/A:1014472731382. Raffiee K, Wendel J. Interactions between hospital admissions, cost per day and average length of stay. Appl Econ. 1991;23(1B):237-246. doi:10.1080/00036849108841068. Shi L. Patient and hospital characteristics associated with average length of stay. Health Care Manage Rev. 1996;21(2):46-61. doi:10.1097/00004010-199605000-00007. Brown MP, Sturman MC, Simmering MJ. Compensation policy and organizational performance: The efficiency, operational, and financial implications of pay levels and pay structure. Acad Manage J. 2003;46(6):752-762. doi:10.2307/30040666. Kunders GD, Gopinath S, Katakam A. Hospitals: planning, design, and management. New Delhi: Tata McGraw-Hill Publishing Company; 2001. Rezapour A, Khalaj M. The economic behavior of general hospitals of Iran University of Medical Sciences from 1997 to 2004. J Shahrekord Univ Med Sci. 2006;8(3):11-16. Rezapour A, Asefzadeh S, Ebadifard AF. Calculating of daily-patient hotel cost in hospitals of Qazvin University of Medical Sciences. Teb va Tazkieh. 2009;18(4):8-18. [Persian]. McKay NL, Lemak CH, Lovett A. Variations in hospital administrative costs. J Healthc Manag. 2008;53(3):153-166; discussion 166-157. Sadaghiani E. Health care and hospital evaluation standards. Tehran: Jafari Publication; 2005. [Persian]. Orendi J. Health-care organisation, hospital-bed occupancy, and MRSA. Lancet. 2008;371(9622):1401-1402. doi:10.1016/S0140-6736(08)60610-8.